A week or so ago I posted about Self-Training and I thought I would put my money where my mouth is. 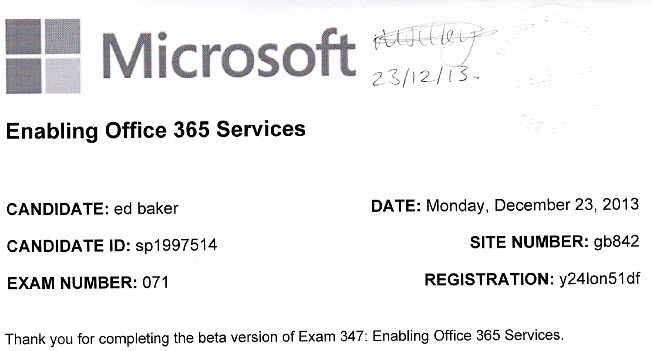 On December 23rd last year (I remember the date clearly), I sat two Microsoft Office 365 Beta examinations. Beta examinations differ from the normal ones in their numbering and more significantly they are often a lot longer and have a whole load of questions that may never appear in the generally available versions. The final and most significant difference for me is that instead of seeing the result on screen and walking away with a score report, you simply get a thank you for sitting the examination printout, no result. I have taken Beta examinations in many technologies and my record up until December was around 75-80% success. This pair of beauties was a very different experience. I usually walk out with a degree of confidence and some home. This time I absolutely knew I had failed both quite comfortably. The examinations in questions were 071-346.
the 071 signifies a beta examination. My assessment was correct in the examination results, I failed both with no possible suggestion of a mistake! Shortly after I received the results, I joined Microsoft UK and the last 3 months have been somewhat of a blur of activity and learning but nothing that I could use towards a certification. presenting at conferences and demonstrating products is very different to using them int he field and I have long proclaimed that to know a product you have to deploy and use it either in a lab or production environment. (added to my shame is that I have had an Office 365 subscription since the beginning). To cut a long story short and to prove I do know the product I have decided to retake these exams and claim my MCSA in office 365. Roles and responsibilities change all the time at Microsoft and one thing is for certain being proficient in Microsoft Cloud technologies will not be a hindrance! So by the end of June i will retake these exams and keep you up to date with my studies and resources used. So what do I have to learn. The Microsoft Learning website has a list of every examination and the required skills that will be tested. My system is simple, copy the list to a OneNote document and from there create a number of links to resources I already have or resources I find that refer to those topics OneNote allows me to embed audio, video, PowerPoint presentations etc. A large number of these links are likely to be from www.microsoftvirtualacademy.com – a quick search provides a very large number of courses for Office. 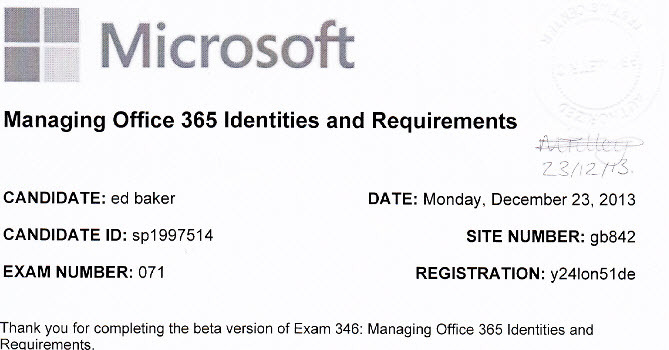 So what exactly do I need to study in Office 365 for the first examination. I do have an advantage here. One of the reasons I take a Beta exam is that if I fail it I may have a better idea of where to concentrate my future studies. So when I use my OneNote resource library, I can remove some of the entries or send them green as I know that section. Here’s an example of the 70-346 list of skills required. Please note that this section of “Provision Office 365” may have up to 15-20% of the total examination questions so spend your time wisely. It is also worth noting that this is not an exhaustive list and the forums on BornToLearn are full of complaints about this. Be aware that you can be asked any question about the product and related technology, these are not meant to be easy paper certifications. Microsoft examinations are now a tough and fair test (mostly! some howlers do slip through but are removed as soon as possible). Also note that some of your research work has been done for you, the blue text at the bottom is linked through to TechNet articles on the correct areas to study. So – watch this space – I will be posting about my experiences both in learning and in testing, although what can be revealed about the content of the test is limited to NOTHING AT ALL. For a guide as to the type of question types you are likely to receive check out these short videos (checkout the section Exam Formats and Question Types), particularly this one, on the Best Answer type of question, I really do not like these! Finally, please, at all costs avoid Practice test sites that guarantee a pass, no one can do that! (without cheating) and cheating leads to some pretty career limiting punishments as well as having a certification that means nothing at all.